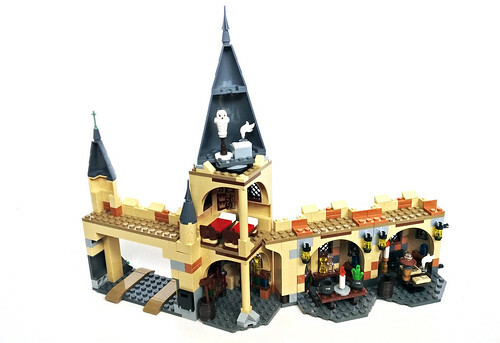 Onwards with my reviews of the LEGO Wizarding World Harry Potter sets, the next one I’ll be taking a look at is the Hogwarts Whomping Willow (75953). 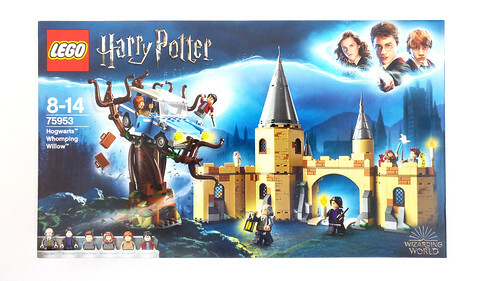 The set has 753 pieces and retails for $69.99 but you can probably find it a bit cheaper for the next few weeks or so. 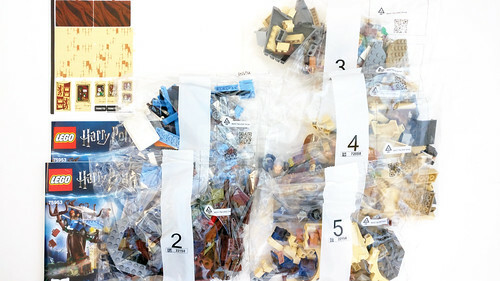 There are five numbered bags, two instruction booklets, and a sticker sheet. 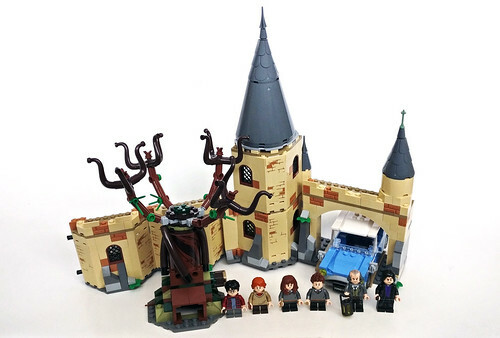 There are five minifigures in this set which include Harry Potter, Ron Weasley, Hermione Granger, Seamus Finnigan, Argus Filch and Severus Snape, as well as Hedwig. 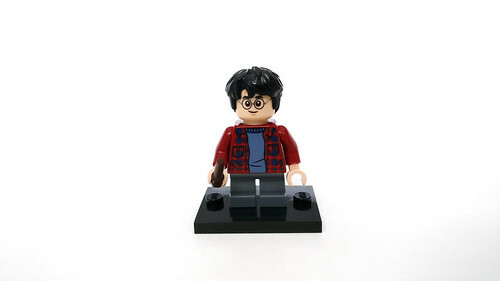 Harry has on a blue shirt with a plaid jacket that he’s seen wearing before in the movie. He has a happy expression on one side and a scared one on the other. 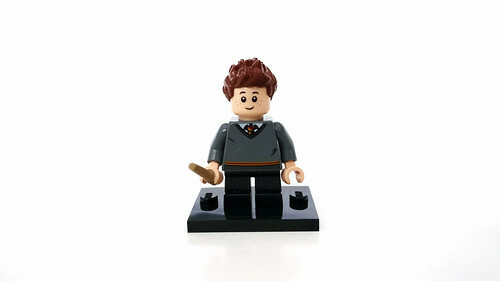 His accessory is a dark brown wand. Ron has on a dark tan striped sweater with short brown legs. He also has a double-sided head with a happy expression on one side and a scared one on the other. 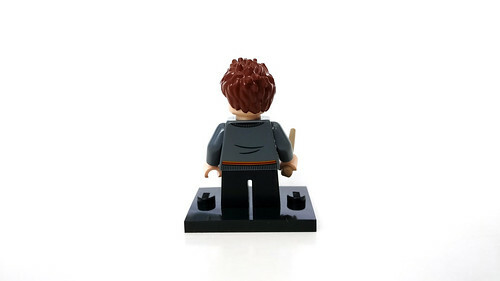 His accessory is a brown wand. Hermione has on a gray sweater with a Gryffindor colored tie. Like with Harry and Ron, she has a double-sided head with a confident and scared expressions. Her accessory is a tan wand. 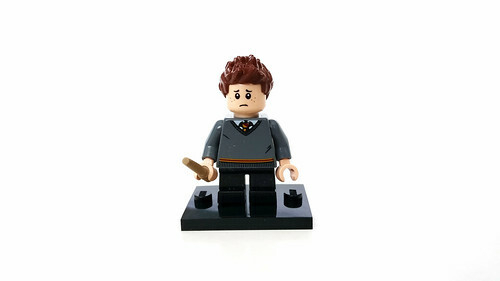 Like with Hermione, Seamus also has the same outfit. His facial expressions include a happy smile and a sad one. His accessory is also a tan wand. 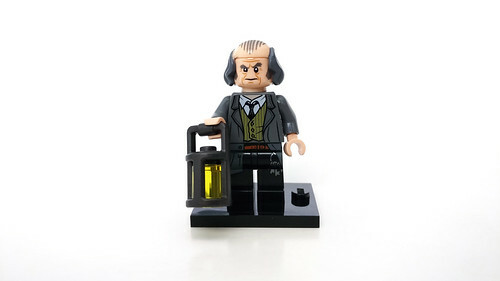 Argus Filch has on a gray tailcoat with an olive colored vest and white shirt. 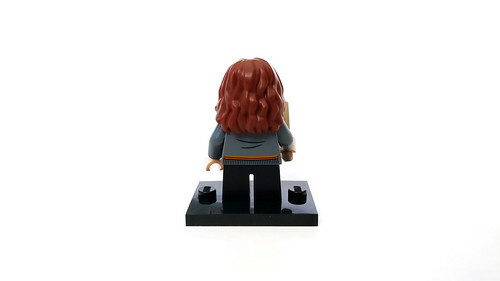 The printing of the coat goes down to the legs and there’s also printing of his keys. He has a stern expression on one side and an angrier look on the other. The hairpiece has him bald on the front and top with longer strands on the sides and around back. 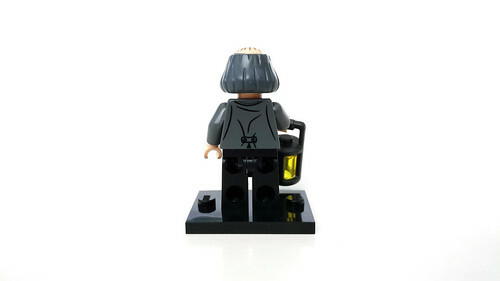 His accessory is a lantern. 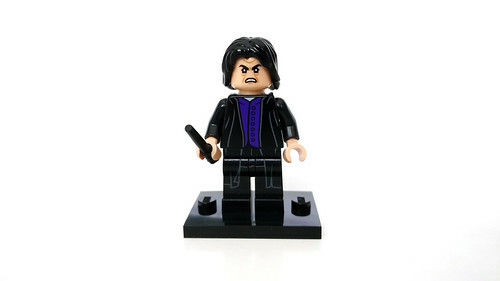 Lastly we have Severus Snape who is the exact same minifigure as in the Quidditch Match (75956) sporting a purple shirt with a black jacket. Again, a cape would have completed his look. He has a double-sided head with a grumpy look on one side and an angry look on the other. 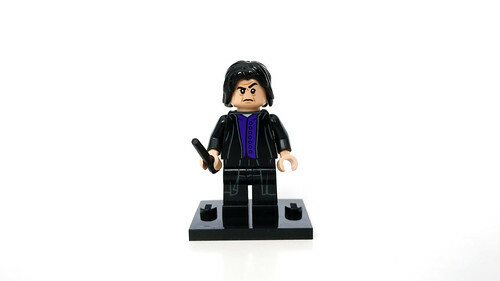 His accessory is a black wand. 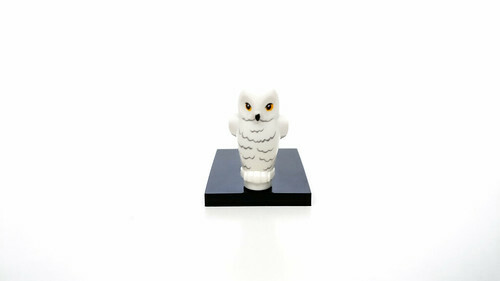 Hedwig is a white owl with some gray lines to represent the feathers on the front. 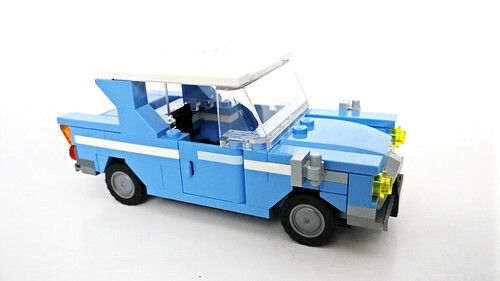 The build starts off with the Weasley’s Ford Anglia. 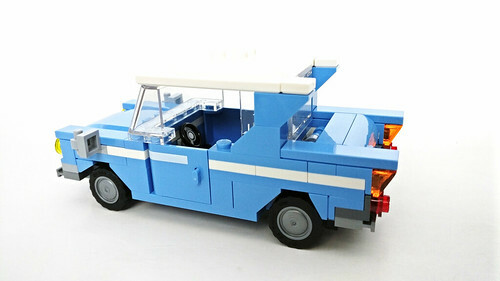 LEGO has designed the six-wide vehicle to match the unique shape of the Anglia and it would fit fine in a LEGO City layout. 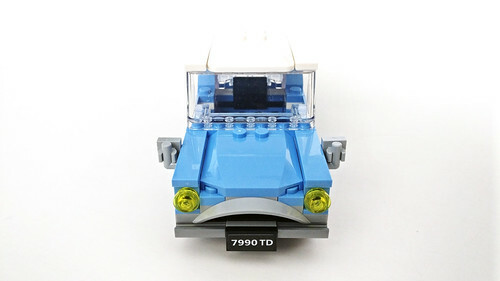 On the front of the car, it uses a wheel arch to create the radiator grill. 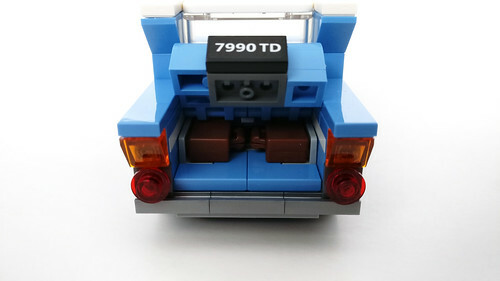 On the side view, the front wheel arches uses an interesting building technique where the 1×1 cheese slopes are upside-down on the tiles. They are kept in place a few steps later using some plates on top. The doors have printed white lines to match up with the rest of the car. The Anglia is able to fit both Harry and Ron with one minifigure standing behind the other. 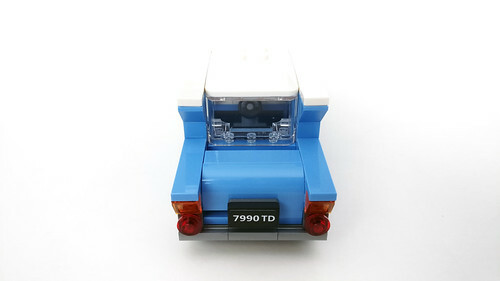 The roof is easily removable to access the interior. On the back of the car, the main feature here is the trunk that is able to open to fit two suitcases. 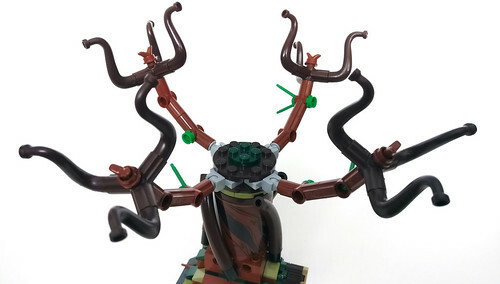 The next build in the set is the Whomping Willow. It has a dark and reddish brown color scheme with some greens thrown in as well. 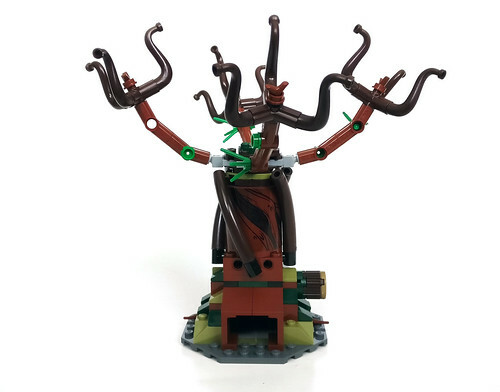 There are long curved dark brown branches that wrap around the trunk which are some stickered half cylinder pieces. 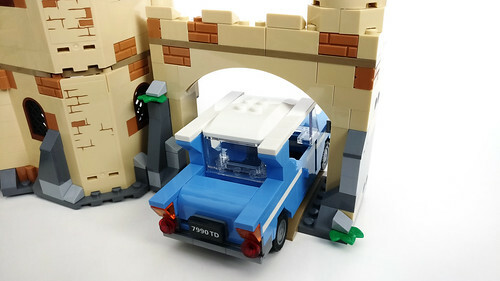 The long lanky branches on the tree are on ball joints so they are well articulated and are able to “grab” the Ford Anglia like in the movies. 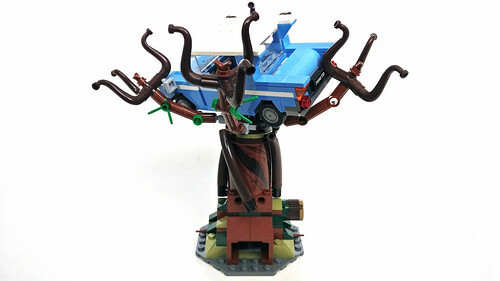 One neat play feature here is that there are some Technic gears hidden inside the trunk and you are able to spin the branches using the knob on the side of the tree. At the bottom of the Whomping Willow, there is an hidden passage that goes to the Shrieking Shack. 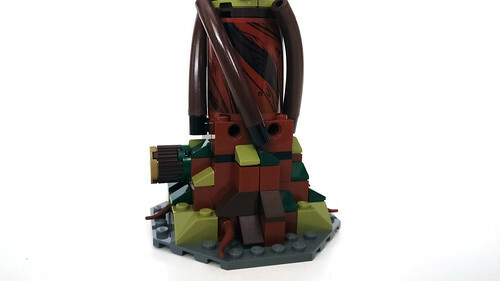 What’s interesting here is that LEGO left the base of trunk open so you can actually add this set on top of a custom base. 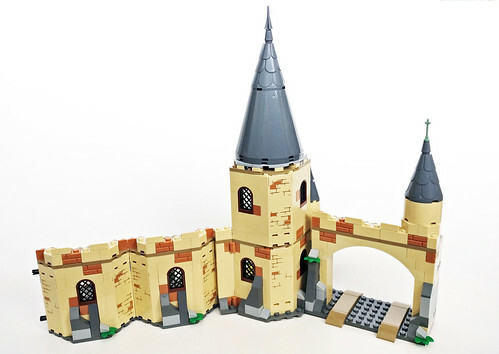 The last part of the build and the most pieces of the set actually goes to the little section of Hogwarts Castle. The middle of it has a large archway for the Ford Anglia to go through as it left after dumping Harry and Ron out. A lot of the detailing on the front side of the castle actually uses stickers with some masonry bricks scattered throughout. 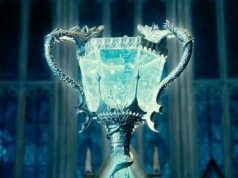 On the other side, Snape’s office is filled with some little details including his desk which has a copy of the Daily Prophet and a Wingardium Leviosa charm. On the walls are a couple of stickered Hogwarts Portraits. 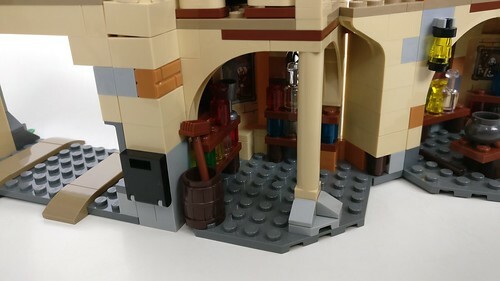 The room just on the other side of the archway is part of the Potion’s Classroom. 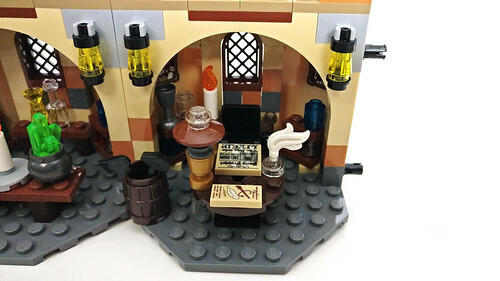 It is mostly filled with potions on two shelves. The back wall as a portrait of an unknown wizard. There’s also a box that holds a green frog inside. 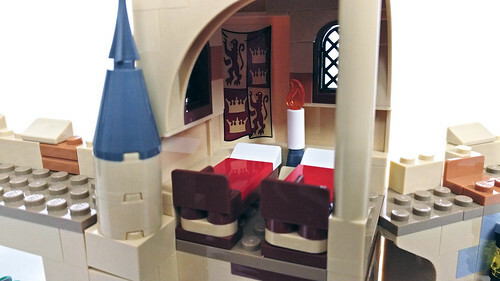 Above that room is the Gryffindor dormitory that is basically two beds for Harry and Ron. The back wall has a sticker of the Gryffindor banner. 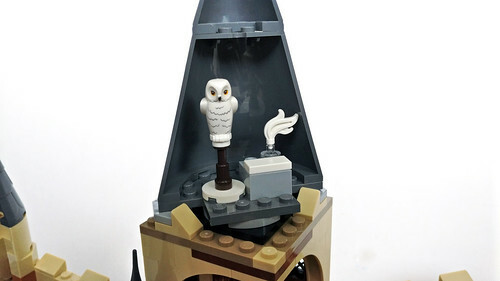 The next level up at the turret is the owlery which has a desk with an inkpot and some parchment along with Hedwig. 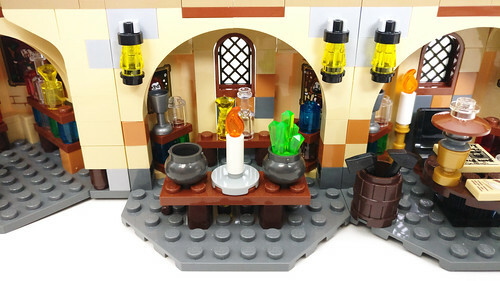 The final room is the rest of the Potions classroom and the middle has a desk with a candle and a couple of cauldrons, one of which has exploded represented by a trans-green crystal. 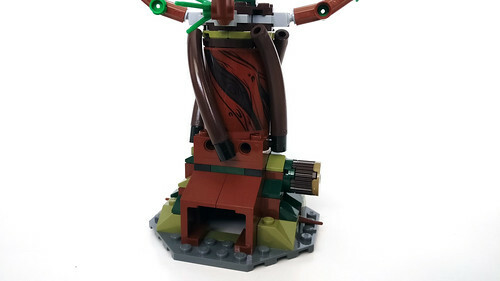 Overall the LEGO Harry Potter Hogwarts Whomping Willow (75953) is a pretty fun set. 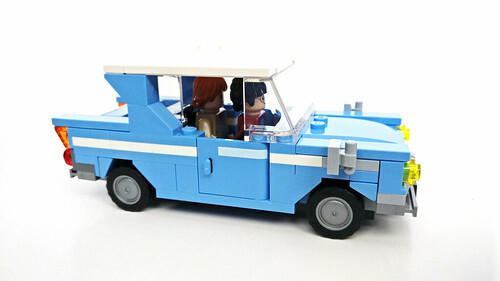 I’m mostly impressed with the Ford Anglia and the Whomping Willow. Some fans may be deterred from the stickers on the trunk but they also look good without them. 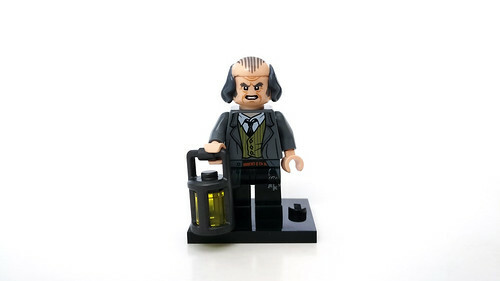 The minifigure selection is great with some exclusive ones to this set like Filch and Seamus as well as Ron and Harry with their out of school outfits. 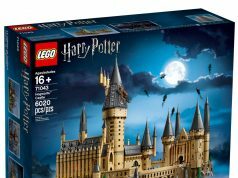 The Hogwarts Castle section of the set is somewhat bland although it does give us Snape’s office and a couple sections of the classroom. 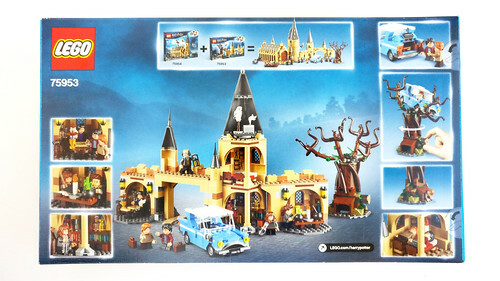 In addition, you are able to connect this set to Hogwarts Great Hall (75954) for more playability.